The Associated Press award, which has been in place since 1957, is the more prestigious official honor. 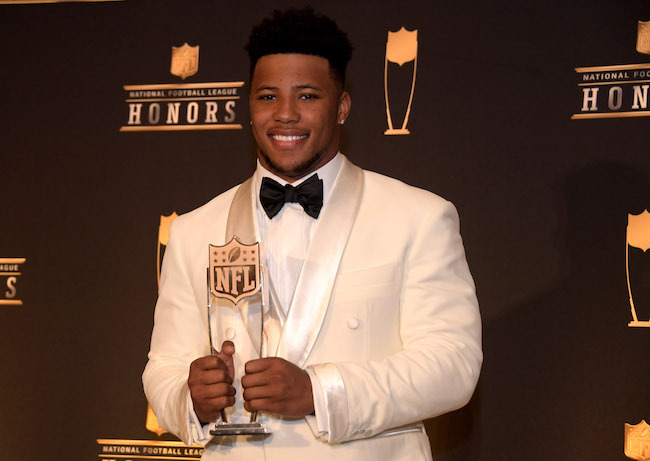 Barkley is just the second New York Giant to ever win the award, the first being wide receiver Odell Beckham, Jr.
“It’s crazy to win this award,” said Barkley. “Definitely an honor. You dream about stuff like this when you’re a little kid. To actually accomplish this is amazing. In 2018, Barkley became only the third rookie in NFL history to accrue 2,000 yards from scrimmage and breaking a number of franchise records. He also was voted to the Pro Bowl. Overall, Barkley started all 16 games, rushing 261 times for 1,307 yards (5.0 yards per carry) and 11 touchdowns. He also caught 91 passes for 721 yards and four touchdowns. Overall, Barkley led the NFL with 2,028 yards from scrimmage. Barkley led the NFL with seven 40+ yard runs and six 50+ yard runs. The latter figure is the highest single-season total by a Giants player since the 1970 merger.